Since announcing our intent to build and open a brewery, we are often asked the question of how we came up with the name Hidden Sands. Many assume it has something to do with our location in Egg Harbor Township and its proximity to the barrier islands of the Jersey Shore. While we are happy to be near the coast and look forward to serving both locals and the shore’s many visitors and tourists, the truth is our moniker is derived from the single most important ingredient in brewing beer: water. The right water is vitally important to the brewing process, yet is so often overlooked by many startup breweries who focus on obtaining specialty malts or unique hop varieties and then simply hook into whatever municipal water is available. Water has such a profound effect on the character of beer that brewers are often forced to treat their water sources in various ways in order to achieve their desired results. What if, on the other hand, excessive treatment wasn’t necessary? To that end we set out to start with the best available water source in order to brew the best possible beer. Our search led us to a water source many hundreds of feet underground known as the 800-foot Sands Aquifer. 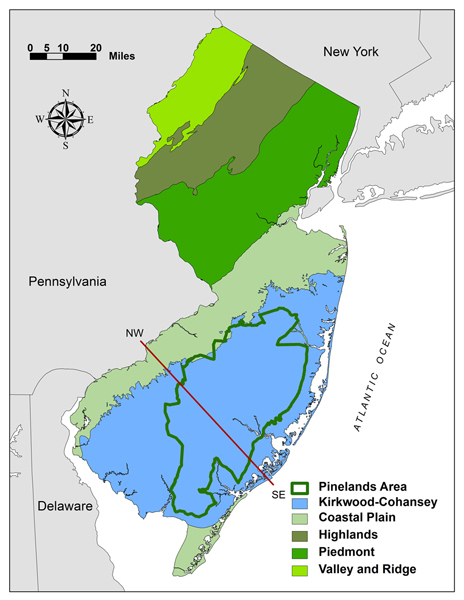 The 800-foot Sands Aquifer is part of the Kirkwood-Cohansey Aquifer system that covers most of southern New Jersey and is like a giant underground lake below the Pinelands. 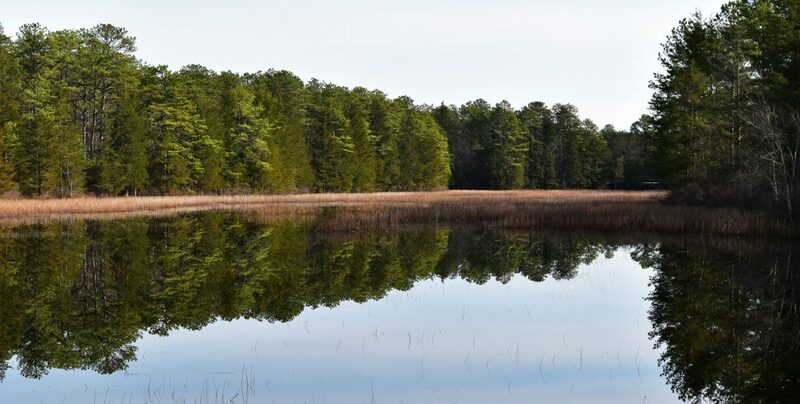 There are only a few aquifers beneath the Pine Barrens that can be used for domestic water use. From the oldest to youngest they are the Potomac-Raritan-Magothy (also referred to as the Lower, Middle and Upper aquifers), Englishtown, Wenonah/Mount Laurel, Piney Point and the Kirkwood-Cohansey aquifer system. 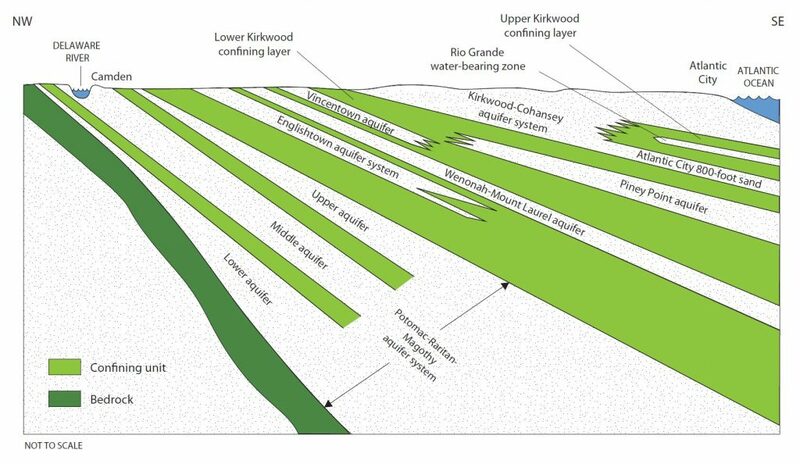 From an ecological perspective, the most important aquifer is the Kirkwood-Cohansey, since it is the shallowest, and provides water to streams, rivers and wetlands. The sandy soil acts like a natural filter which traps any impurities before they reach the aquifer, which means the water is very clean and pure. It contains 17 trillion gallons of water, which if pumped above ground would be enough to cover the entire state of New Jersey 6 feet deep in water. Before drilling a well to access the groundwater “Hidden” beneath the “Sands” (get it? ), we contracted a geological study of samples to determine whether or not we could brew with it. We discovered that the layers of sand, silt and clay the underground water is filtered through make it ideal for brewing a number of different classic and modern styles of beer, such as German Style Pilsners, American IPAs, and Porters. From a mineral content standpoint it is similar to the classic brewing waters of Dortmund Germany, home to world-class export lagers. To borrow from Pride & Prejudice, “it is a truth universally acknowledged that a brewer in possession of great water must be in want of an appropriate recipe to brew with it,” so we brought in veteran brewer Mike LaRosa to help develop those “appropriate” recipes that will define our core brands going forward. LaRosa has worked with a variety of breweries over his career, including positions with Rock Bottom Brewery in King of Prussia, PA and Tired Hands Brewing Co in Ardmore, PA. He has earned a number of accolades and awards, including RateBeer’s best brewer in both New Jersey and Pennsylvania for multiple years, Gold Medals from both GABF and World Beer Cup, along with a James Beard Award nomination. Our water is in very capable hands. Stay tuned for information on what our core lineup will include, as well as our opening date announcement!